Measuring zones of inhibition. Gray shading represents a confluent lawn of bacterial growth. The white circle represents no growth of the test organism. Modified Kirby-Bauer disc diffusion test method is a reference method which could be used as a routine technique to test the sensitivity of the isolate in the clinical laboratory. The disc diffusion method was originally described in 1966, and is well standardized and has been widely evaluated. Prepare the inoculum from the primary culture plate by touching with a loop the tops of each of 3 – 5 colonies, of similar appearance, of the organism to be tested and transfer this growth to a tube of saline. If the inoculum has to be made from a pure culture, suspend a loopful of the confluent growth similarly. Compare the tube with the 0.5 McFarland turbidity standard (approx cell density 1.5 x10^8 CFU/ml) and adjust the density of the test suspension to that of the standard by adding more bacteria or more sterile saline.Remember: Proper adjustment of the turbidity or the inoculum is essential to ensure that the resulting lawn of growth is confluent or almost confluent. Image 1: Swabbing pattern to to ensure proper inoculation of organism. Inoculate the plates by dipping a sterile swab into the inoculum. Remove excess inoculum by pressing and rotating the swab firmly against the side of the tube above the level of the liquid. Streak the swab all over the surface of the medium three times, rotating the plate through an angle of 60 ° after each application. Finally, pass the swab round the edge of the agar surface. The swab should follow as it is drawn across the plate (as shown in figure). #Discard the swab into an appropriate container. Leave the inoculum to dry for a few minutes (at least 3 to 5 minutes, but no more than 15 minutes) at room temperature with the lid closed. Antimicrobial discs can be placed on the inoculated plates using a pair of sterile forceps. It is convenient to use a template to place the discs uniformly or a sterile needle tip may also be used to place the antibiotic discs on the plate. Alternatively, an antibiotic disc dispenser (as shown in the image-2) can be used to apply the discs to the inoculated plate. Disks should not be placed closer than 24 mm (center to center) on the Muller Hinton agar plate. Ordinarily, no more than 12 disks should be placed on a 150-mm plate or more than 5 disks on a 100-mm plate. #avoid placing disks close to the edge of the plate as the zones will not be fully round and can be difficult to measure. 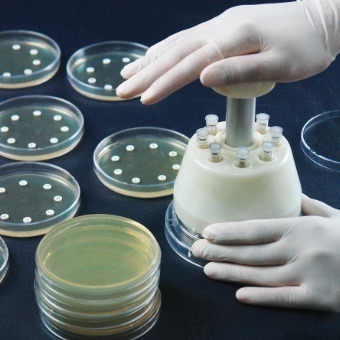 Each disc should be gently pressed down to ensure complete contact with agar surface and do not fall when the plate is inverted during incubation. #Do not push the disc into the agar. The plates should be placed in an incubator at 35 °C within 30 minutes of preparation. Temperatures above 35 °C invalidate results for oxacillin/meticillin. #Do not incubate in an atmosphere of carbon dioxide, this will decrease the pH of the agar and result in errors due to incorrect pH of the media. After overnight incubation, the diameter of each zone (including the diameter of the disc) should be measured and recorded in mm. The results should then be interpreted according to the Antimicrobial susceptibility interpretation chart. with a ruler on the under-surface of the plate without opening the lid. If the medium is opaque, the zone can be measured by means of a pair of calipers. A template may be used to assess the final result of the susceptibility tests. With sulfonamides and co-trimoxazole, slight growth occurs within the inhibition zone; such growth should be ignored. When β-lactamase-producing staphylococci are tested against penicillin, zones of inhibition are produced with a heaped-up, clearly defined edge; these are readily recognizable when compared with the sensitive control, and regardless of size of zone of inhibition, they should be reported as resistant. Certain Proteus species may swarm into the area of inhibition around some antibiotics, but the zone of inhibition is usually clearly outlined and the thin layer of swarming growth should be ignored. Measuring zones of inhibition. Gray shading represents a confluent lawn of bacterial growth. The white circle represents no growth of the test organism. Results can be read after 18 hours of incubation. 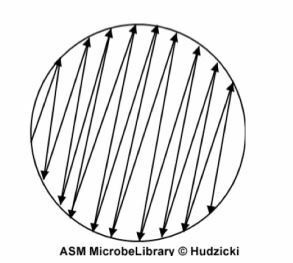 Following incubation, measure the zone sizes to the nearest millimeter (mm) using a ruler or caliper; include the diameter of the disk in the measurement. Using the published CLSI guidelines, determine the susceptibility or resistance of the organism to each drug tested . Note that there are different charts for different organisms. For each drug, indicate on the recording sheet whether the zone size is susceptible (S), intermediate (I), or resistant (R) based on the interpretation chart. The results of the Kirby-Bauer disk diffusion susceptibility test are reported only as susceptible, intermediate, or resistant. Zone sizes are not reported to physicians. Thank you for this presentation. Please, what is the “unmodified” Kirby Bauer test, and how does it differ from the “modified” Kirby Bauer test?